Are you part of the ten percent who can solve this puzzle? River Test is an app for the iPhone, iPod Touch, and the iPad by Cramzy. This game is about solving only one puzzle and allows you to challenge others to see if they can do it. Whether or not ten percent of the world’s population can solve this puzzle is true or not, I thought this was an interesting concept and wanted to try it. The puzzle is about moving eight people from one side to the other but there are certain rules that you must follow. You can only move up to two people at a time. Tap on the character to put him or her onto the raft then tap the red lever to move them. The game will remind you when you make an invalid move. It will keep track of how many moves you have made and how long it took for you to beat it. You can purchase the solution and it will be there when you need it. There is a slight variation to the solution which is picking the gender you want to move first but it has no impact on the game. When I beat the game and tried to pick play again, it might have a minor glitch in which the raft would move to the other side. You have to press the question mark then select go to menu to reset the puzzle. Other than that and the slightly annoying way of resetting the game, I did not have any other problems with the controls. 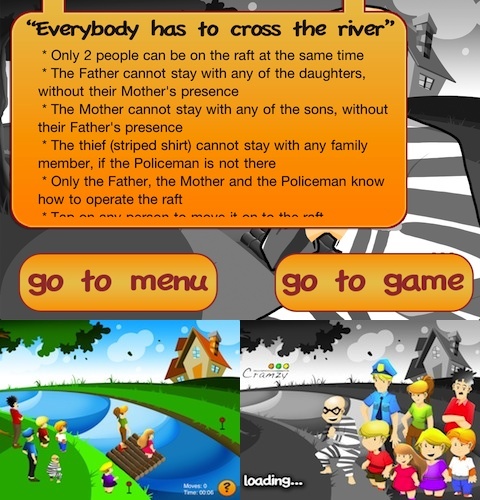 Visually, River Test is a simple and colorful game. It has a generic cartoon look with no signs of pixelation. The characters’ faces are a bit small so it looks like they are missing noses or they were created like that. The only things that move are the levers and the rafts. You will be congratulated for solving the puzzle but there is nothing spectacular for doing so. The graphics for this app is polished and simple. The audio is the worst part of the game. There is nothing and I mean nothing. I can understand if someone wants peace and quiet to solve a puzzle but hearing crickets chirp is not a good thing. There is no iPod music support and no congratulatory audio cue. I would like the option to listen to music. River Test is available for free in the App Store. The solution costs $0.99 if you give up. This puzzle is easier than I thought. I was expecting something that would take a few weeks to solve. The concept for this game is interesting but I didn’t find it to be as challenging as I hoped it to be. The game guides you by giving a notice when a move can’t be made. You can beat this game through trial and error. Having no sound wasn’t a big deal to me since it was a puzzle game but no congratulation sound effect or iPod music support is an odd choice. Despite all that, I think this is a nice start for this type of puzzle and it allows people to challenge others. My best record is under twenty turns in forty-eight seconds. AppSafari review of The River Test was written by Tony Lau on December 22nd, 2011 and categorized under App Store, Free, Games, Puzzler. Page viewed 3840 times, 1 so far today. Need help on using these apps? Please read the Help Page.